The golden era of Southern soul was essentially over by 1971, but thankfully no one told O.V. 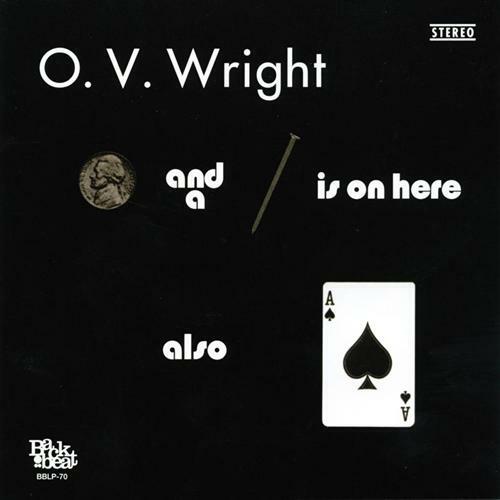 Wright about this; this album, which as the title suggests featured two of his biggest hits, showed that his gifts as a vocalist were near the peak of their strength, and this is Memphis-style R&B in the grand tradition. Willie Mitchell produced these sessions at his Royal Recording Studio in Memphis, with the Hi Records Rhythm Section and the Memphis Horns providing the backing, and their performances lend the music a smooth, glorious burn like fine brandy, and are not unlike the work they did with Al Green, but reveal a darker and bluesier tone. Great as the band is, Wright headlines this show, and when he sings he dominates these sessions with grace and authority; the longing and hurt in his voice are a wonder to behold, and the burnished gospel influences in his voice meld the secular and the sacred with a powerful common belief, particularly on "He Made Woman for Man." The lovers' ache of "Don't Take It Away" and "When You Took Your Love from Me," and the blues-shot laments of "A Nickel and a Nail" and "Afflicted" are as powerful as Southern soul got in the early '70s. Wright was a master of this form, and while he would lose his life only nine years after this album was released, A Nickel and a Nail and Ace of Spades sounds like the work of an artist as powerful and vital as you could ask for. Brilliant music, despite cover art that makes this look like a low-budget bootleg.